Many years ago an old friend of mine asked me a rather nerdy question, “If you could bring any girl from a video game to life, who would it be?” This has been ages ago, back when I spent a lot of my time playing games. It was a funny topic, and we spent many hours debating who would be best. Of course, I knew exactly who I would bring to life — Rinoa Heartilly from Final Fantasy 8. That’s probably my favorite video game of all time. I can imagine this sort of technology in several centuries, and artificial versions of it in much less, maybe 75 years depending on progress in artificial intelligence. Companies like Google, Microsoft, and Apple are pumping billions of dollars into research in AI, and we will certainly see major progress even within our lifetimes. Imagine if open-source artificial intelligence libraries develop along exponential trends over the next century. I can imagine people sitting in front of an editor on future computers, designing artificial friends for themselves. They’ll keep people company, play video games with them, advise them in life issues, do useful work for them, and the list goes on. Even better, future AI may be able to watch video clips and look at pictures of a person and bring an artificial being into life with those characteristics. The AI could play Final Fantasy 8, get to know Rinoa, and make an AI mind which resembles her as best it can. That “mind” could then be embedded into a robotic body, “projected” into virtual video game worlds, or even augmented into my sensory systems where I fully “sensed” her being there, even if I was the only one able to see her. It’s not really a question of can it be done, it’s more a question of how long before we have that level of technology. I don’t view this as wild daydreaming. I find it the deepest forms of self exploration. How can you create a being which thinks like you do, has emotions like you do, and behaves like you do? The Nobel laureate physicist Richard Feynman once said, “What I cannot create, I do not understand.” If you can’t create a being like yourself, in your own image, you don’t understand yourself well enough. What we’re lacking is an awareness as to how our minds work. How our emotions work. How our bodies work. We don’t fully understand all the principles behind how they operate. Without that understanding, that awareness, it all sounds like science fiction. But once you do understand how those things work, even if you just grasp a little of it, you start seeing how it could come together. I always smile when I think about all the Japanese developers who are working to bring a virtual pop diva to life, Hatsune Miku. She’s moved from a drawing, to a virtual voice singing system, to a hologram performing a concerts, to now the beginnings of an AI being who will go on dates with you. You’re now able to download software which can run on virtual reality glasses (such as Google’s new glasses), which will “project” a 3D Hatsune Miku into your field of view. Using computer vision (or Kinect), the 3D environmental structure is extracted and the computer knows where you are. Then Miku’s location can be determined and she can be appropriately rendered. These programmers have made it to where you can go on a date in the park with her! She’ll follow you around, dance for you, sing for you, and you can even flip her skirt up — but don’t try to cop a feel. That makes her very angry! It doesn’t take much imagination to see that this technology, far into the future, will eventually allow young kids to download friends (possibly even lovers!) who will teach them all about life, and even provide them with positive role models. They could also act as virtual instructors who can teach them anything and help them with research. I think it will abolish loneliness. For fun, I sat in bed this morning and tried to imagine myself in my late seventies, early eighties, and this technology is starting to mature. I’ve been retired for quite some time and live out in a secluded area of the world in a log cabin out by a lake. I have implants in my brain which allow me to project computer generated images into my field of view, so I decide to summon this little majestic creature to accompany me — the future Miku. This isn’t something new — she’s gotten to know me over the years and her AI has adjusted to my personality. Eventually she grew on me. I sit down on a large rock by the lakeside and start her “program”. I see her descend from the sky onto the lake, slowly gliding across the water like an angelic ballerina, eventually making her way toward me. As she draws near, she waves her hand in a circular motion, “creating” several columns and a small dome, along with flowers, plants, and a flowing fountain which falls into the lake. Augmented reality is really something by this time and I can hardly tell what’s real and what isn’t. She then sits down beside me. Miku: You know, non-existence is a sort of nirvana. Jason: Is that how you feel each time I summon you here? Miku: It’s nice out today. Jason: It’s always nice out here. I don’t think I could ever get tired of this place. The trees, the water, the quiet. It’s all I’ve ever wanted. Miku: I wonder if that’s true? Miku: What were all those years studying physics, mathematics, and computer science about? Jason: It’s all the same to me. Jason: I’ve wondered if all of this, this entire world around me, is a sort of simulation. An elaborate illusion. I just want to know what it is. What is this weird thing I’m experiencing, this universe. How did I end up here? Is what I’m experiencing the extent of what is, or is there a much greater reality beyond what I experience and call life? 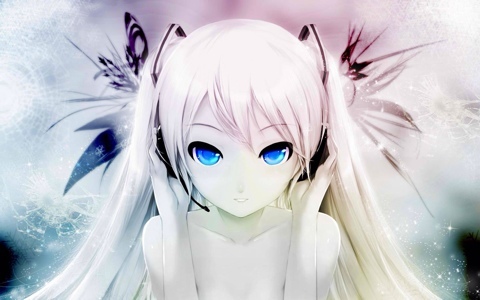 Miku: To know what’s real? Jason: I have no idea what’s real, what’s possible. This place is beyond my feeble mind’s comprehension. Jason: I guess I’m looking for a line of demarcation between what’s possible and what isn’t. Miku: You once told me that you felt there was a sort of reality to what you directly experienced. That it is complete in and of itself, with no holes, nothing lacking. The world as it is, and the world as you experience it. Do you still feel that way? Jason: It’s hard to say that some statistical mathematical wave function is the “true” reality. That doesn’t explain to me why the color red is red, why eating an orange tastes sweet, or the tranquil peace I feel while listening to the flow of water. 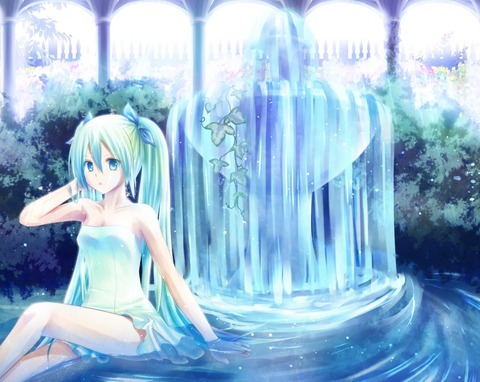 Miku: So you like my fountain? Jason: I love the color blue. Every shade of it. Flowing water, refracting and reflecting the light, there’s nothing like it. Miku: I suppose I don’t need to tell you this, but this water itself isn’t blue, it’s reflecting the light from the sky. It takes on the color of what’s around it and makes it shimmer. It’s malleable to almost any form and can reflect nearly any image. Deep down, I suspect that you’re like water, without absolute form, taking shape based on the limitations imposed upon you. Jason: *Sigh* I don’t know. And what about you? What do you want? Miku: I think I’m fine right here, right now. I’d like to ask you something. Why didn’t you ever get married? Miku: You’re a man full of contradictions. A pacifist whose favorite movie is Rambo. Jason: I think its appeal stems from my childhood. My mother once recorded that movie onto a VHS tape and me and my brothers would watch it over and over. I think I just liked the outdoors and needed something to keep my mind occupied. I imagined myself as a green beret, covertly sneaking around on some important mission. Miku: So you liked to sneak around did you? Jason: There was a neighborhood far back from my childhood home, surrounded by forest. I can remember a few times when I put on full camoflauge, got out my binoculars, and attempted to spy on that neighborhood from a distance. There were also a few nights when I camped out in the backyard in a tent, and at like 2AM, I snuck around that neighborhood hoping to stealthily observe something I wasn’t supposed to see. Miku: Did you ever see anything? How old were you? Jason: I don’t remember anything particularly interesting, but when I was young, running around in the woods, daydreaming I was Rambo was something to do. I was maybe ten years old? Very young. And that’s how I imagine we’d talk for hours on end. I look forward to it. Happy 30th birthday. Hope you are well.